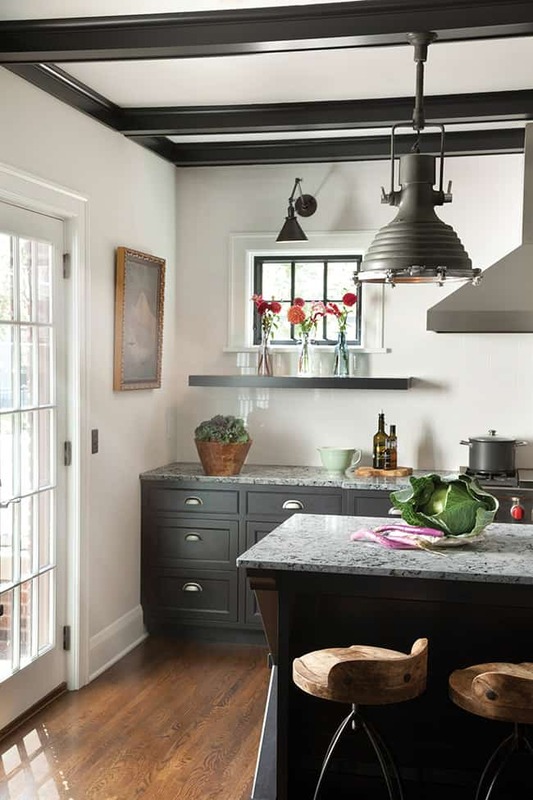 Farmhouse style doesn’t have to be kitschy or too rustic, in fact, if you add a contemporary spin on the overall design you may surprise yourself wit how polished the end result can be. 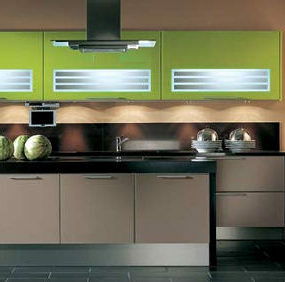 And when it comes to your kitchen, it’s quite easy to do. 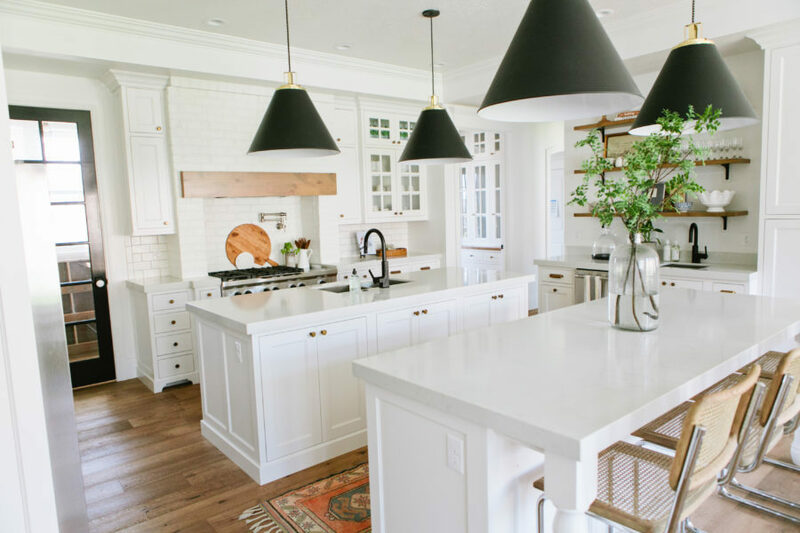 So let’s five in and check out these 38 modern farmhouse kitchens and how they fuse two opposite interior design styles perfectly. 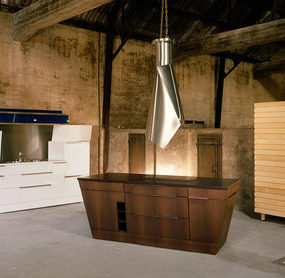 House by Hoff always gives beautiful home and interior design inspiration. 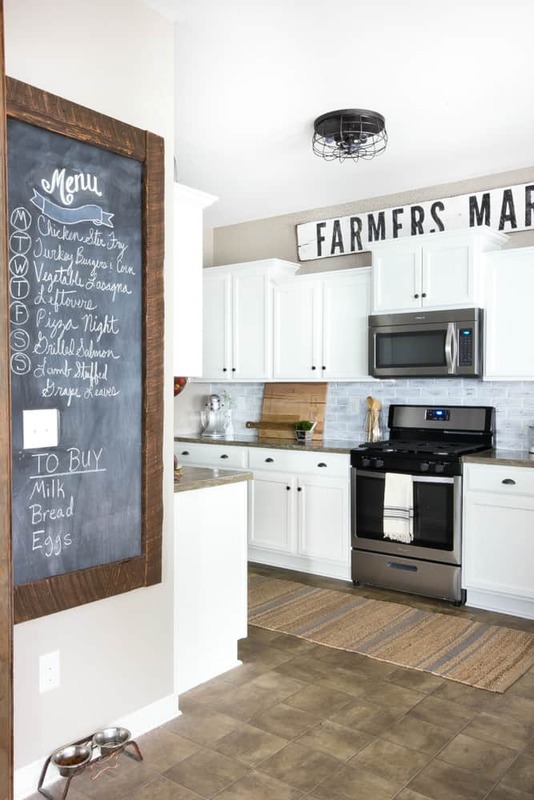 Here we too see how beautifully modern styles and farmhouse vibes can blend in a naturally, subtle way. This space has quite an easy charm about it, don’t you think? City Farmhouse has some great inspiration too. 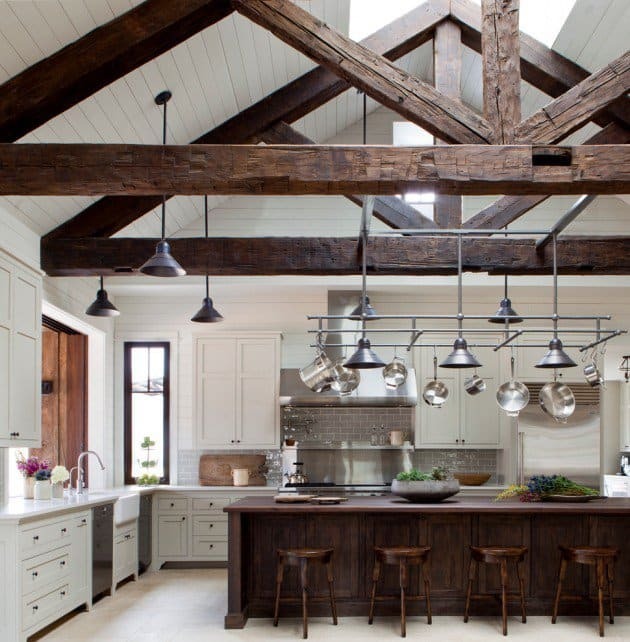 Just look at this light and bright kitchen with it’s modern textures and industrial, country-esque infusion. 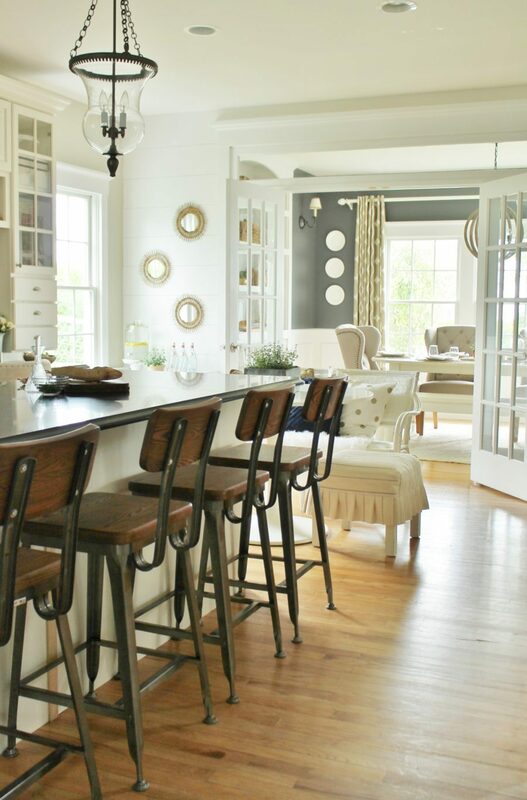 Those chairs, the hardwood floor and light fixtures make the perfect contrast. 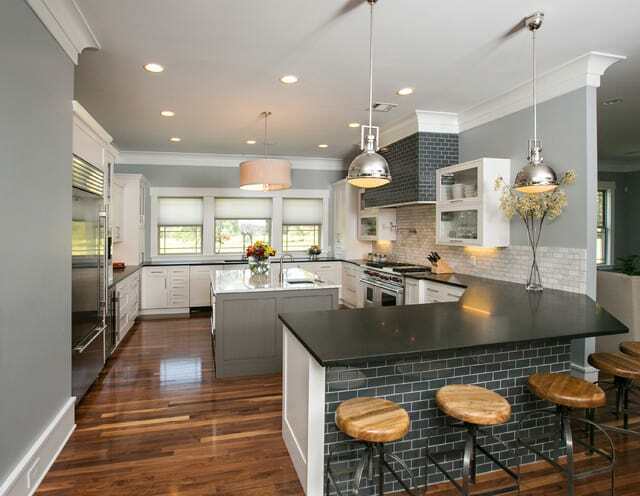 Over at House of Jade you’ll find another beautiful kitchen design we’re swooning for. 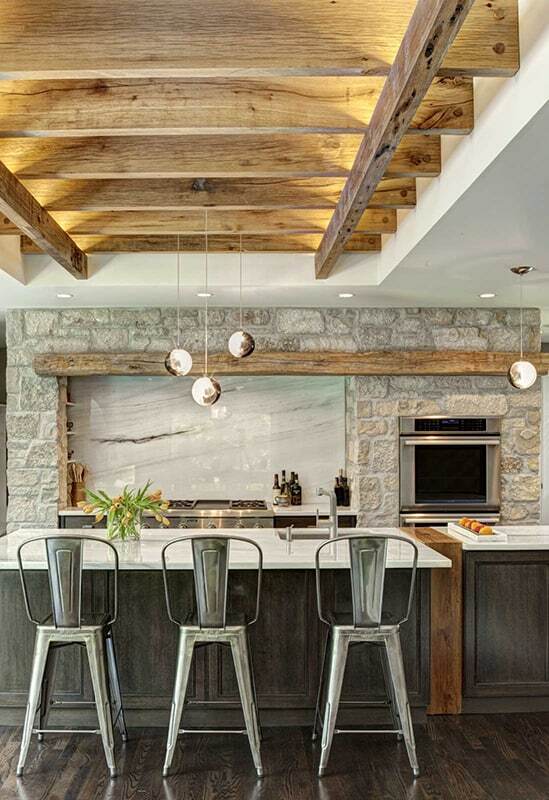 The foundation is sleek and contemporary but the layers of texture and natural wood pieces give it that pop of farmhouse flavor we’re craving. 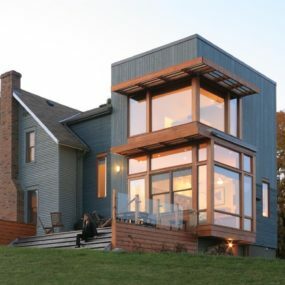 Houzz offered up this beauty. It’s a bit darker in tone and a bit more masculine than the previous contenders but we’re loving that extra edge. 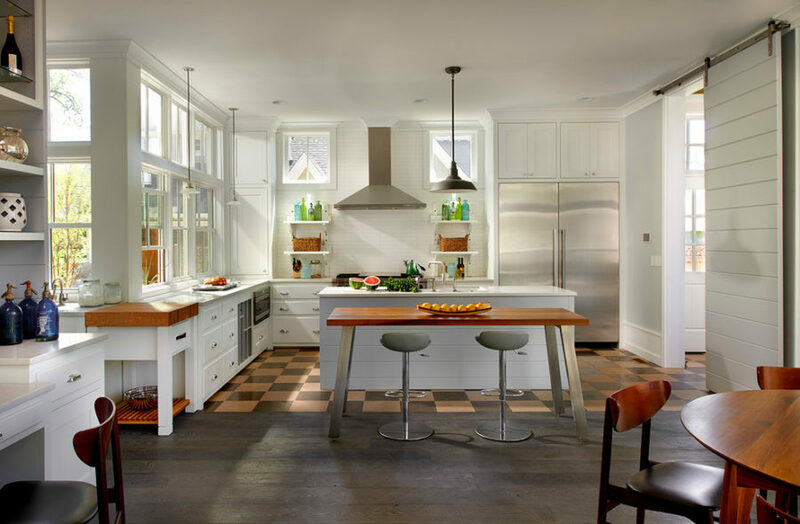 Then, when you add these chic hardwood floors and stools, mixed with the ever-changing textures, you are left with a gorgeous and unique fusion of styles. 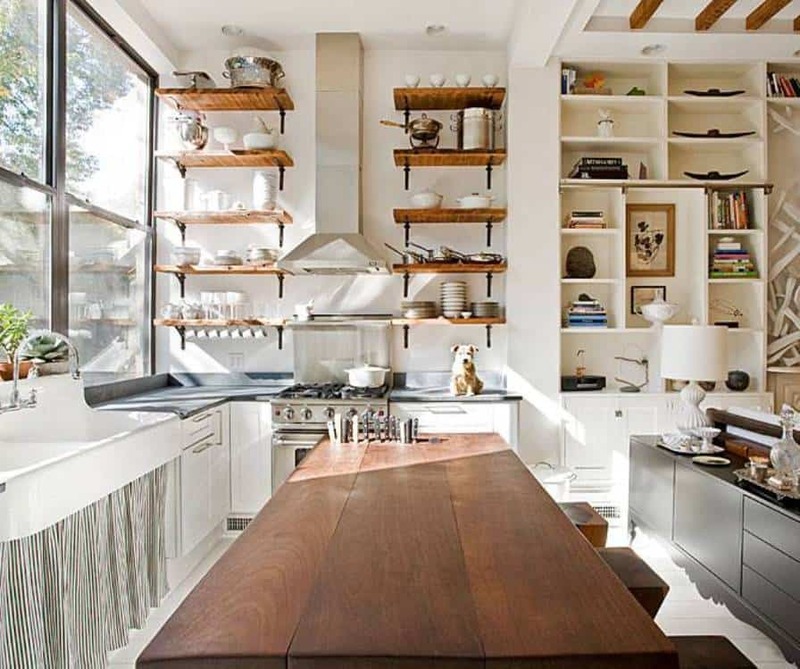 This kitchen looks a bit like an artist’s nook. 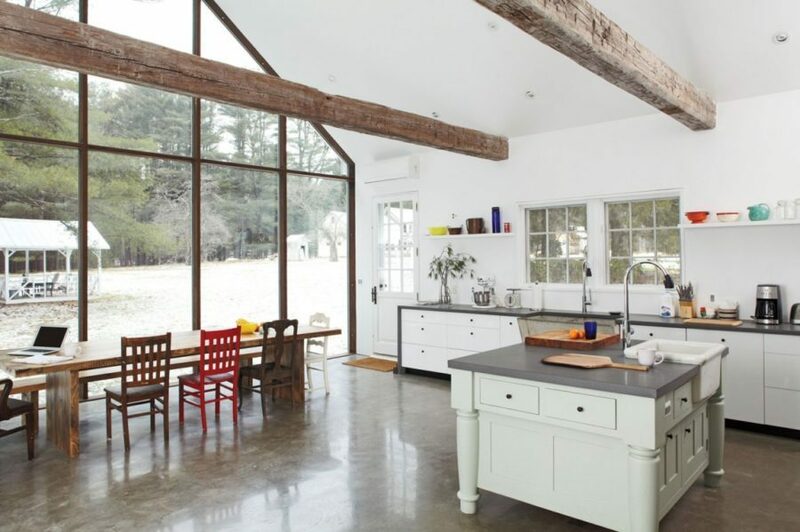 Cook up some dream meals in this naturally-lit space. 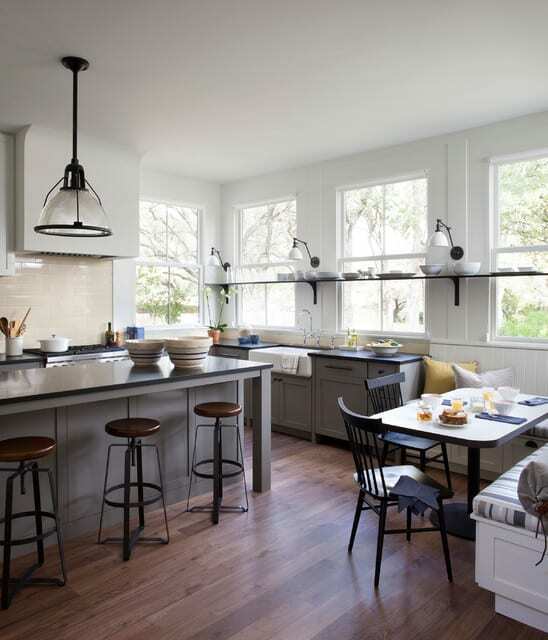 The open-shelving and mixed medium put this Houzz find on our list of perfect farmhouse – modern pairs. 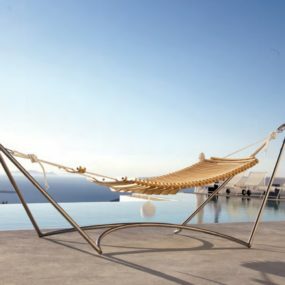 We found this beauty rummaging on Pinterest and were inspired too much not to share. 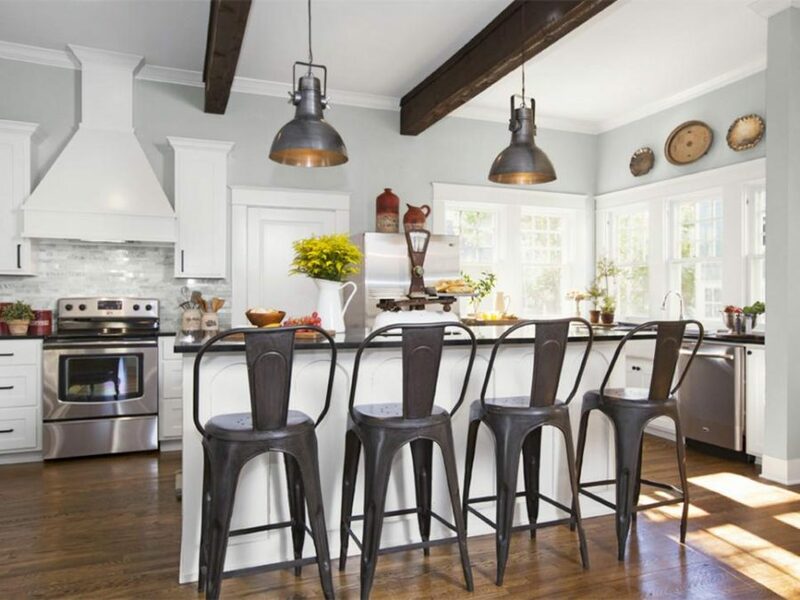 The lightness and easy of both modern edges and farmhouse warmth really light the way throughout the design and décor theme. HGTV enlighten up with this beauty. 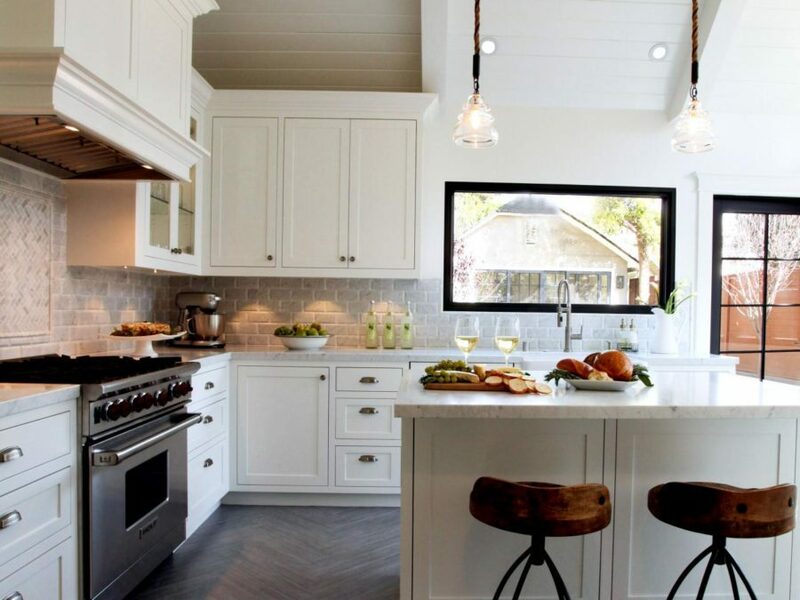 It’s modern, it’s feminine and it’s one of the most fashionable kitchens we’ve ever seen. It’s romanticized a bit though with it’s wooden additions and green touches. 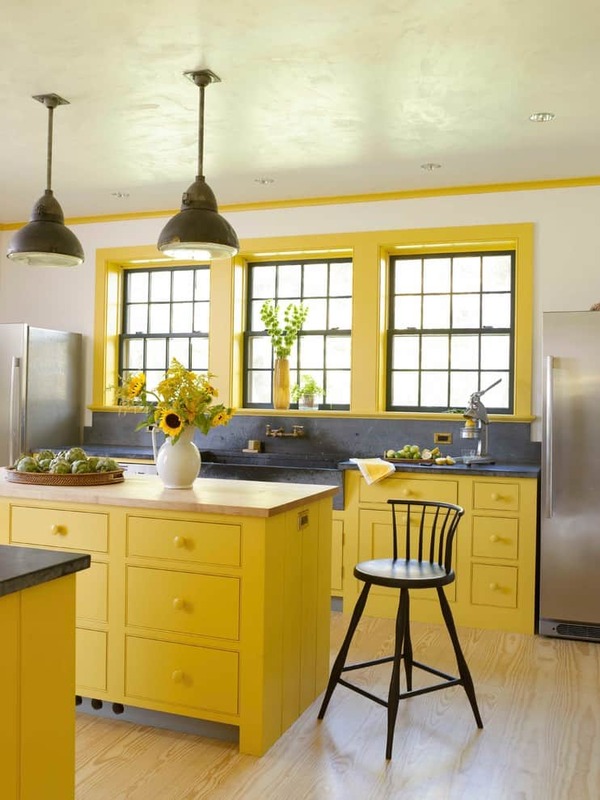 Jeanne Campania shows us another way, a less obvious way, to fuse these two popular styles together. 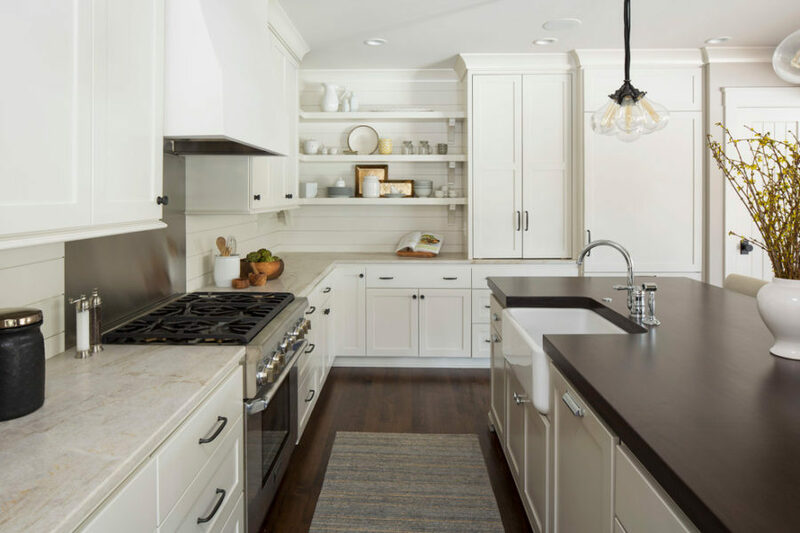 All the elements of this kitchen are farmhouse quality but it’s the shapes and clean edges that provide that crisp, modern look we love. Over at AAD, we found this beauty. 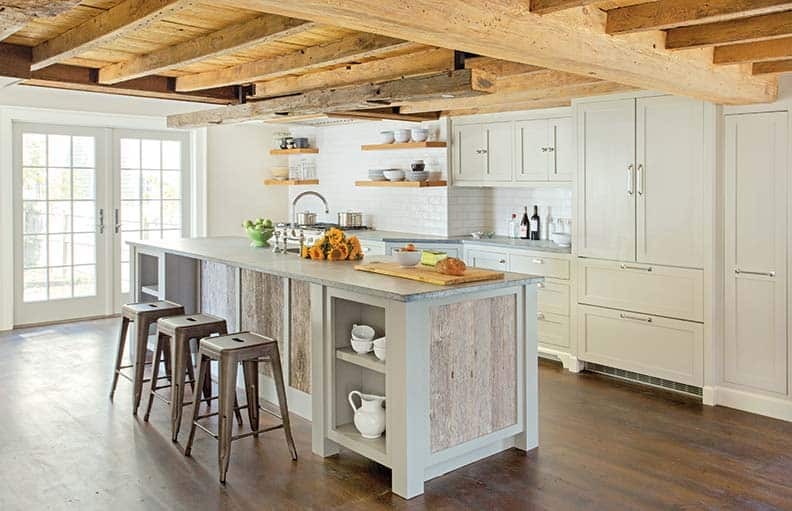 Mixing with industrial, raw edges and wooden, farmhouse ties, you get an interesting kitchen that provides as much style as it does utilization for the family. 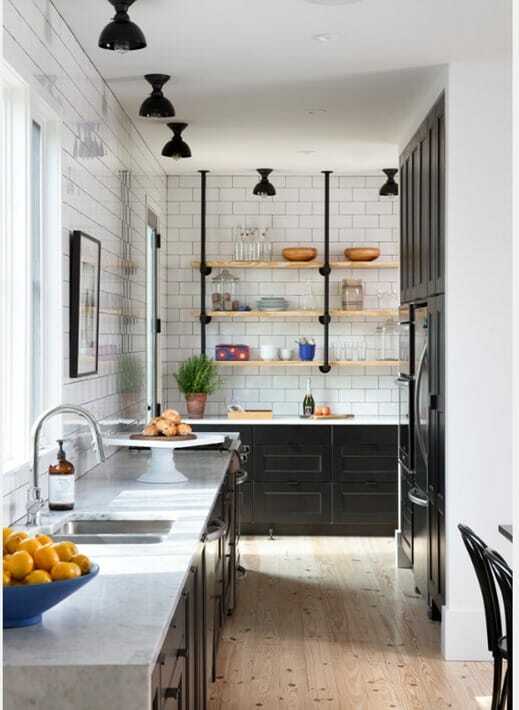 HGTV gives us some great peeks, including this corner of the kitchen. 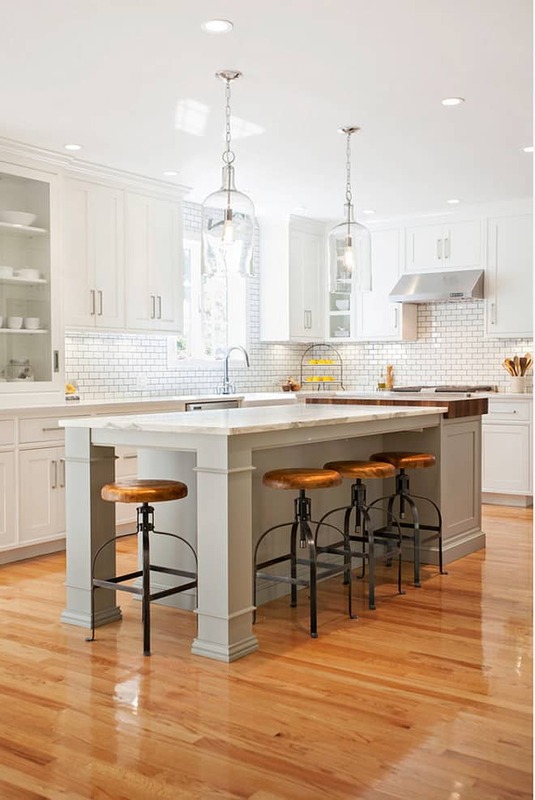 We have wood floors with a chevron pattern, wooden stools, cream cabinets and lighting that blend so beautifully together we don’t even question the seamless pairing of styles. 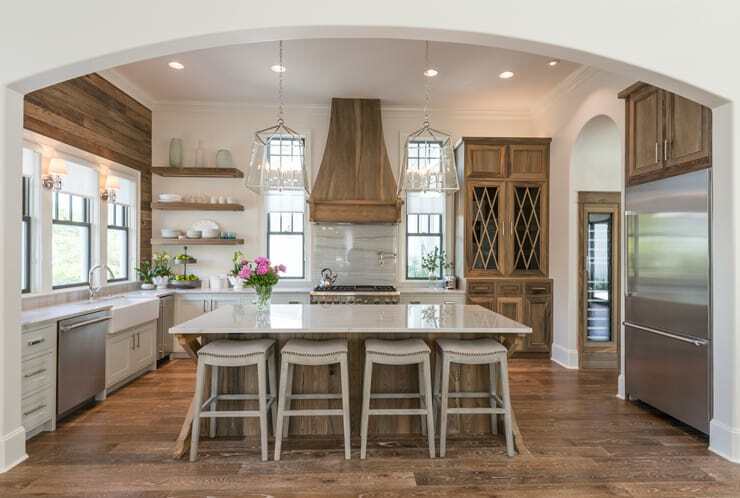 We’re loving the focal point of this kitchen, making it a great spot for prepping, entertaining or just sitting down for an evening bite. It’s also the central focus for the style of the space as well. Thanks City Farmhouse! Pinterest blesses us again with this chic beauty. 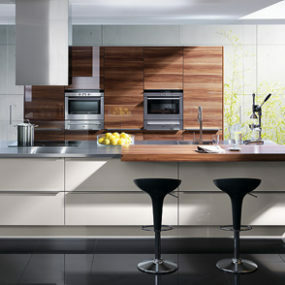 Everything about this minimalistic space speaks volume of modern kitchen design but that slight bit of wood, with it’s natural and raw edges, make it an easy fusion. Sifting through Daily Herald we found this gem. 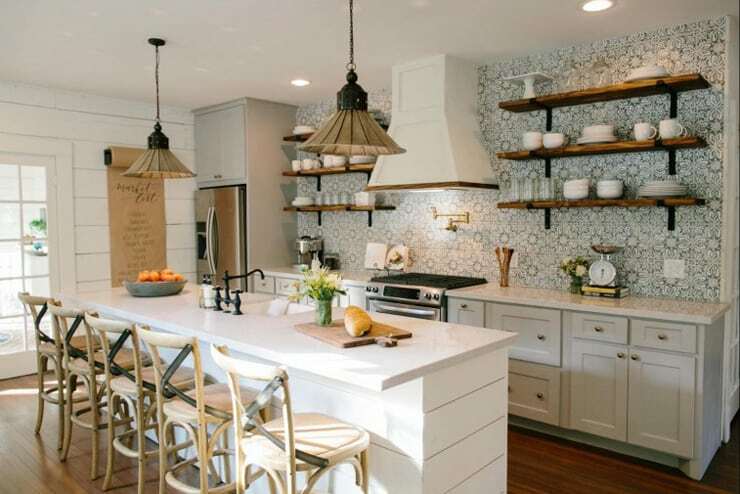 Highlighted by the creamy nature and overall, feminine appeal, there’s a lot of classic, farmhouse elements hidden throughout the design but with hardware and light fixture that keep it contemporary. Jeanna Campana adds a bit of whimsical charm with this design. A patterned accent wall pairs nicely with this bright space. We’re loving the textural differences and its contrast to the clean foundation. Ultimate Christoph shows us how classic, farmhouse open-shelving can be transformed into a more modern look. Here again we see a perfect blend of texture and contemporary design honed inside a spacious and open area. 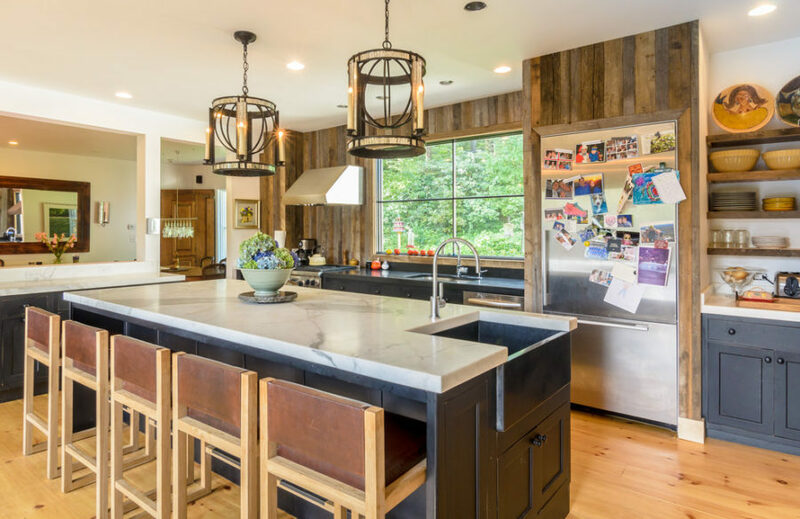 This beauty from Icon Home Design mixes distressed wooden pieces with stainless steel appliances in such a seamless way. Fortunately, this design gives you everything you’d want in a space, from texture to interest in all the right places. 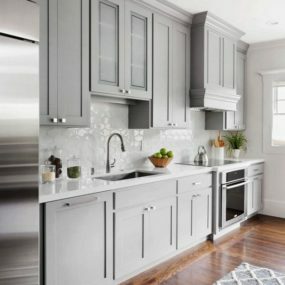 Centsational Girl gives us a classic, black and white kitchen design full of contemporary tone and a pinch of farmhouse flavor thrown in. We see that in the sprinkle of natural wood that pops throughout that open shelving system. 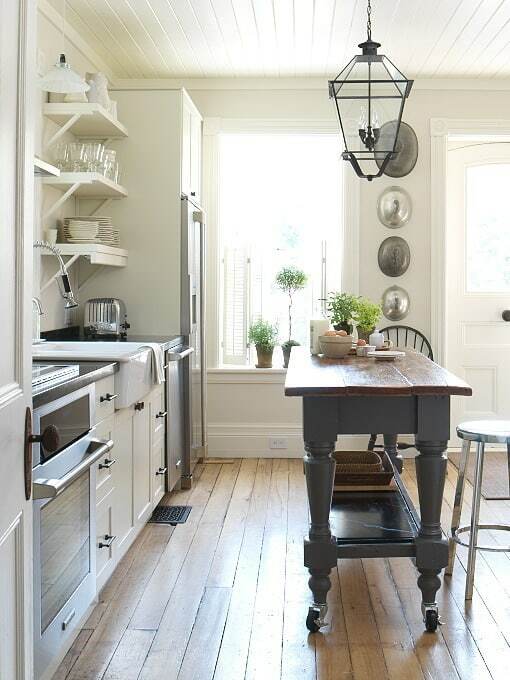 And the light, hardwood floor is a homey touch as well. Pinterest does it again, providing us with some beautiful inspiration. 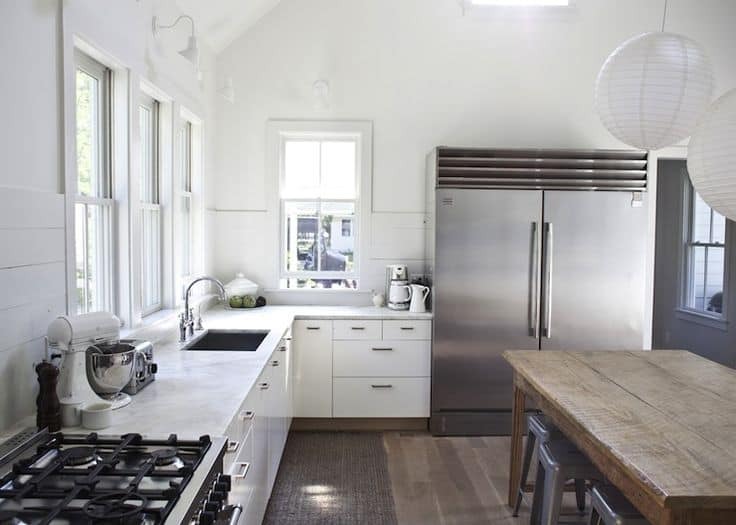 We found this kitchen peek that has both a soft, cottage essence and a chicness that only contemporary styles contain. 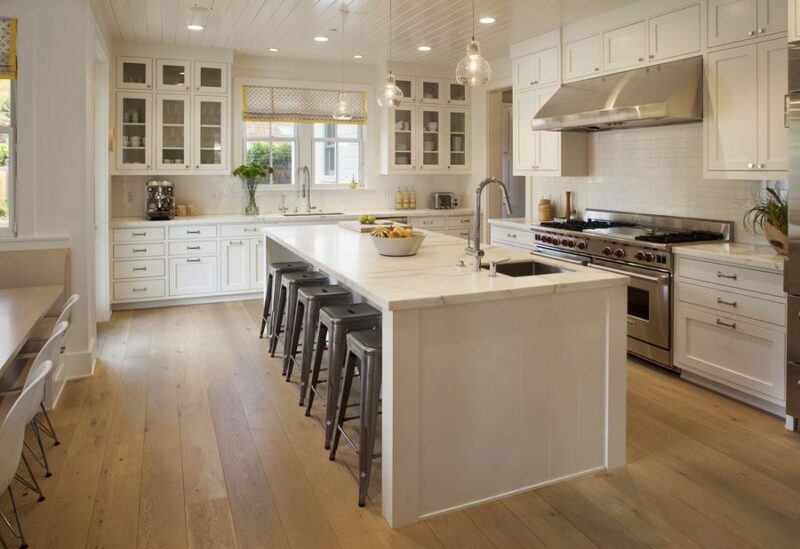 The crisp white foundation and tile floors set the foundation for that easy blend. 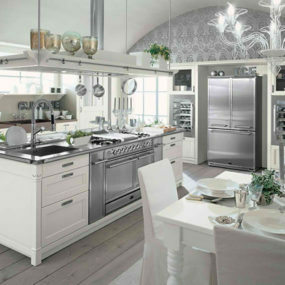 Callier & Thompson gives us a more unique kitchen design. 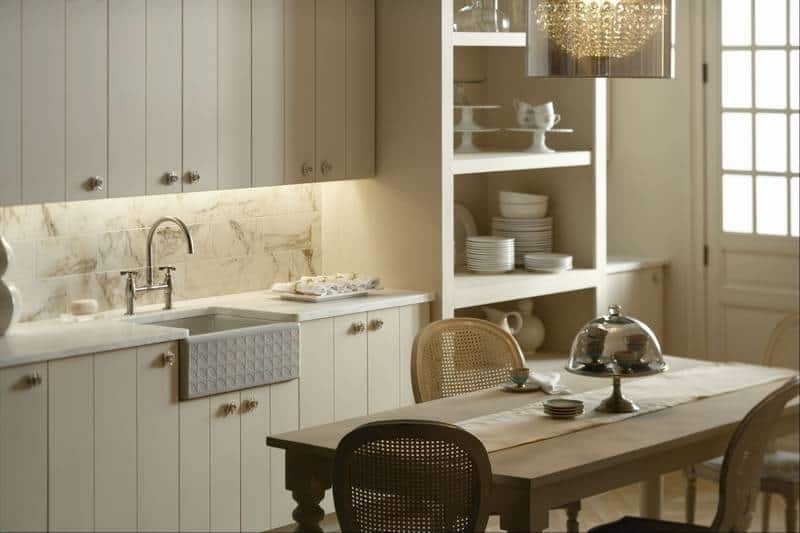 From the stone accent wall, marble and wood, you have so many textures coming together to create a fashion-forward and interesting style. 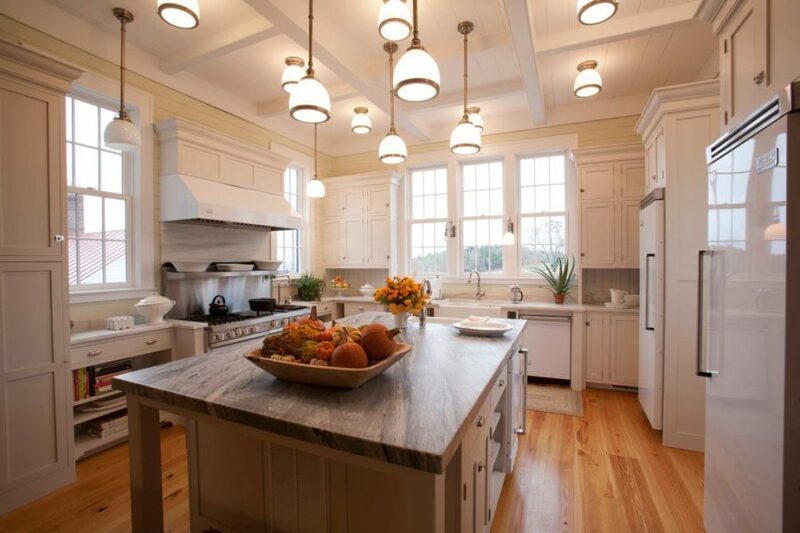 This stunning kitchen from Blesser House may be our personal favorite. 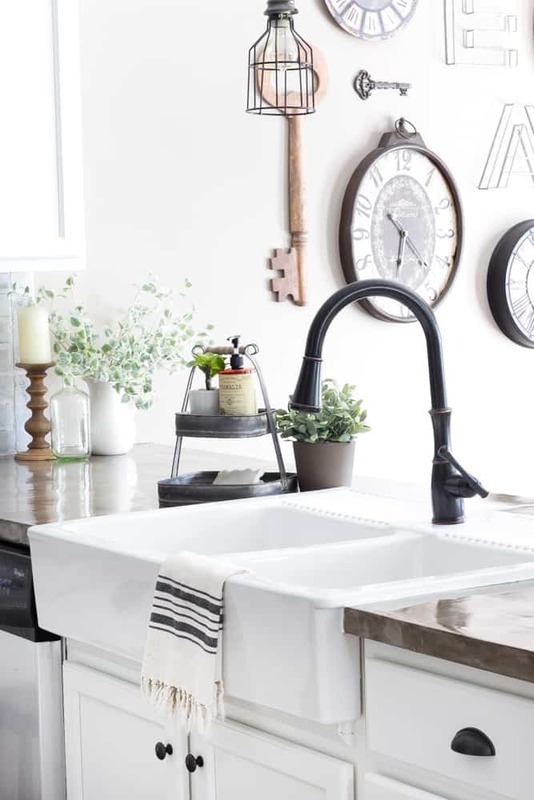 The farmhouse sink, crisp whites and darker hardware choices give us a unique take on modern farmhouse design. 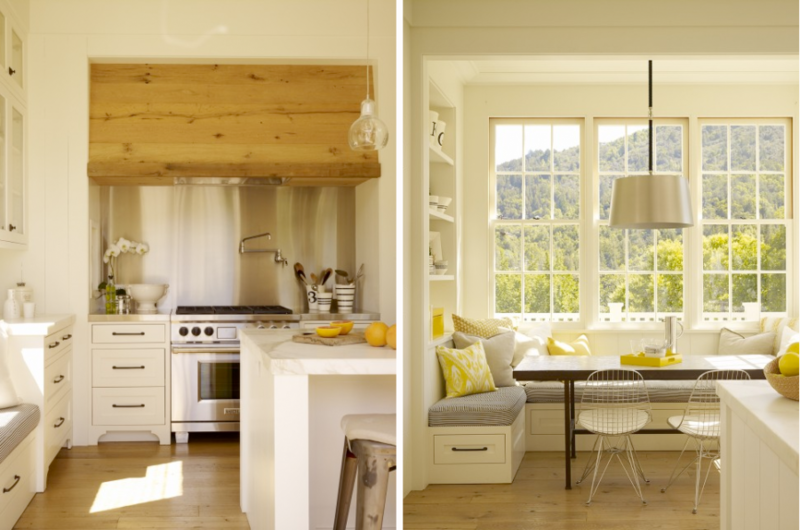 And here’s another peek at the Blesser House kitchen we were just swooning for. Again, we see a beautiful mix of textures and crisp neutrals that blend these two styles with grace and elegance. 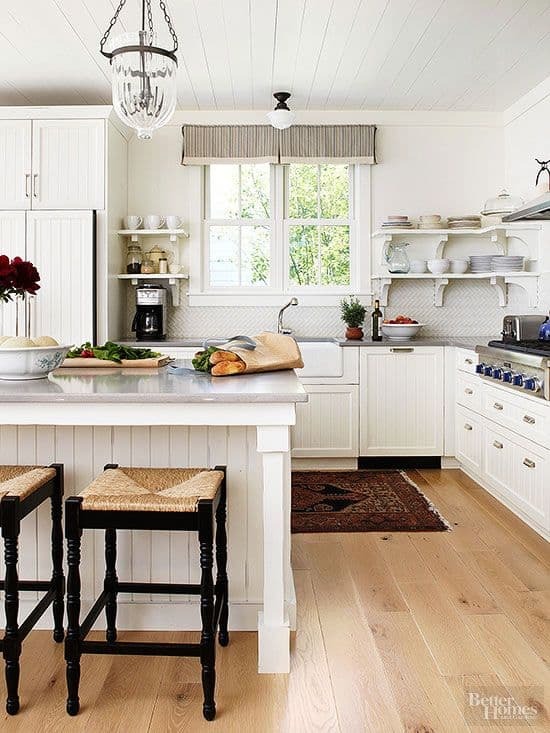 Home Bunch delights us with this polished kitchen style. 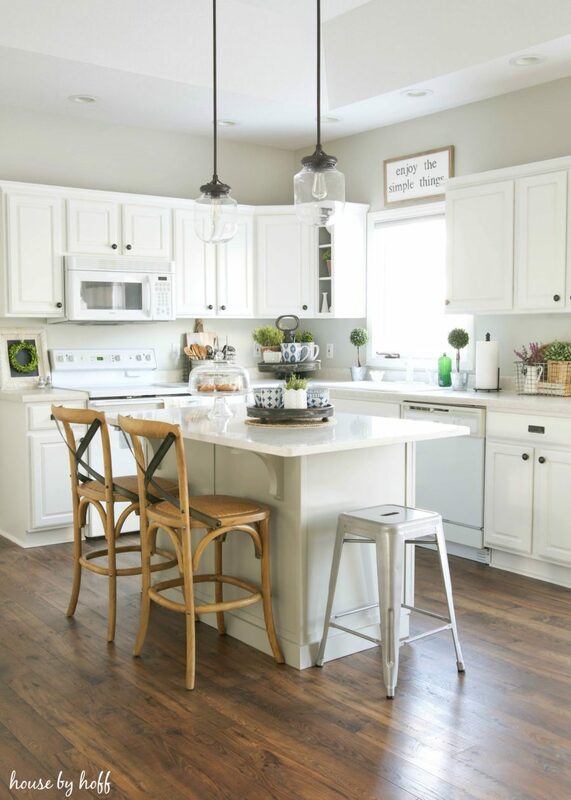 The stools, the floor and the backsplash are three standout elements that mesh well with farmhouse styles and modern visions. 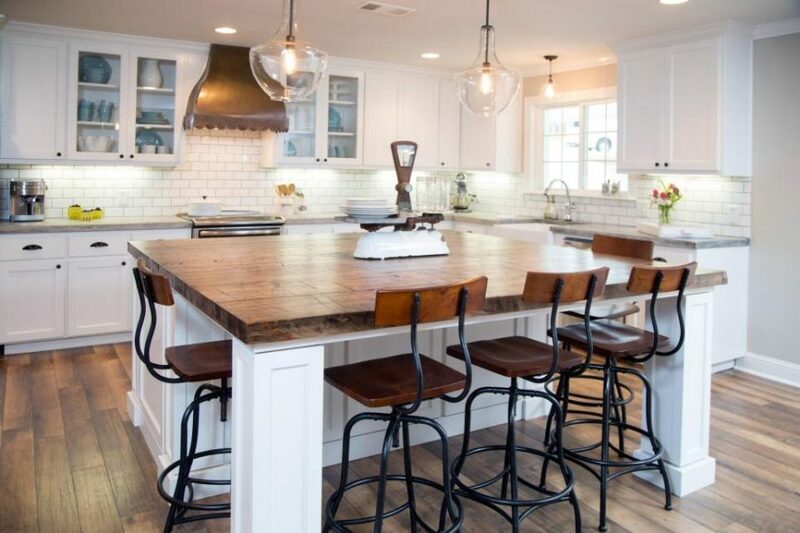 From the lights to the floor, Cambria gives us a more masculine and edgier take on a modern farmhouse kitchen. We love the bit of roughness and darker tones sewn throughout. 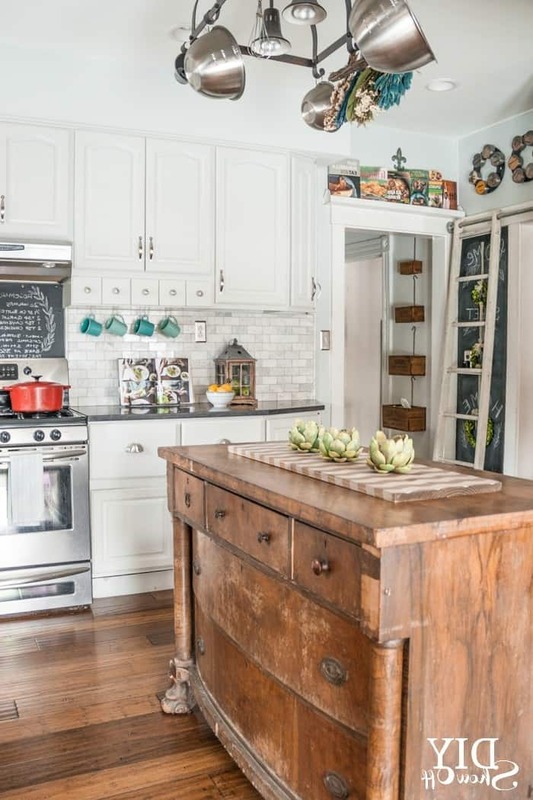 Decor Pad shows off a smaller kitchen that’s dipped in farmhouse flair. 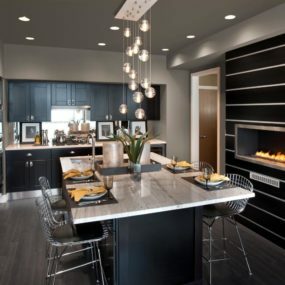 But we still see, thanks to the stainless steel, again, and the light fixture choices, a pop of contemporary style as well. Pinterest does it again with this beauty. Less clutter, updated appliances, soft wood tones … all of this make a beautiful fusion that’s both romantic and welcoming.